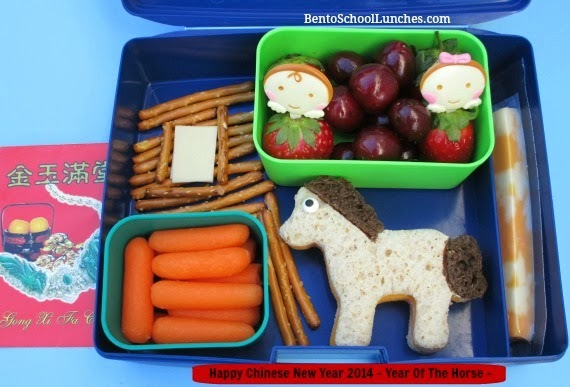 Friday will be Chinese New Year and it will be the year of the Horse! While it is not celebrated locally as it was where I enjoyed my childhood, we try to make it a celebration that our son will remember and cherish. Wishing everyone who celebrates 'Gong Xi Fa Cai'!! Horse shaped sandwich with mane and tail of pumpernickel bread and a candy eye. Lower left: Organic baby carrots. Pretzel sticks barn with provolone cheese window. Upper right: Strawberries and cherries with a couple of cute picks. This is so cute! Happy New Year Rina, Gong Xi Fa Cai! Very very cute!! Have a great Horse year!! !